Air, water, mountains, animals, plants, your body, the armchair in which you sit, in short, everything, from the smallest to the largest thing that you see, touch and feel, are made up of atoms. Both of your hands and also this book you're holding now are made up of atoms. Atoms are particles so small that it is impossible to see even one of them with using our most powerful microscope. The diameter of a single atom is one-millionth of a millimeter. It is not possible for a man to visualize such an immensely tiny scale. Therefore, let us try to approach it using an example. Assume that you hold a key in your hand. Undoubtedly, it is not possible for you to see the atoms of this key. In order to see them, let's assume that we bring the size of this key to the size of the Earth itself. Once the key becomes as large as the earth, then each atom inside the key is the size of a cherry, and so we could finally see them. What then exists in such a small structure? In spite of its small size, inside an atom exists a perfect, unique and complex system. Every atom consists of a central nucleus and electrons revolving around the nucleus in very distant orbits. The nucleus is located at the center of the atom and contains a certain number of protons and neutrons according to the characteristics of the atom. The radius of the nucleus is about a ten-thousandth of the radius of the atom. Now, let's search for the nucleus of the cherry-size atoms as we enlarge the key to the dimensions of the globe as we mentioned above. But this search is futile because it is certainly impossible for us, even at this scale, to observe a nucleus, which is still amazingly small. For us to be able to see the nucleus, the cherry that represents the atom must be enlarged once again until it becomes a giant ball measuring 200 meters in diameter. In spite of this incredible dimension, the nucleus of the atom will still be no larger than a speck of dust. Yet, it is quite amazing that, although the volume of the nucleus is about ten-billionth of that of the atom, its mass constitutes fully 99.5% of the mass of the atom. But how, then, does a thing, on the one hand, constitute almost the whole mass while it does not, on the other, take up almost any space? 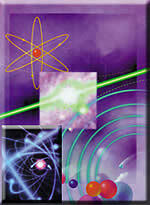 The reason is that the density of an atom, which constitutes its mass, is concentrated in the nucleus of the atom. What provides this is the force called the strong nuclear force. By means of this force, the nucleus of the atom is kept together without being scattered. What we have recounted so far are only a few details about the perfect system that exists in a single atom. In fact, an atom contains an extensive structure on which entire volumes of books can be written. However, even the few details we mentioned here are enough for us to see its magnificent creation and the fact that ALLAH created it. Jazakillah for ur kind words.No,the layout was not designed by us.Glad you like it though.Plz continue to visit!